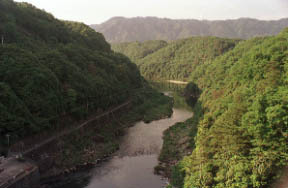 The mugenkyo complete view seen from the Iga river. 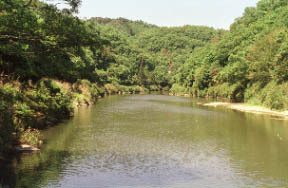 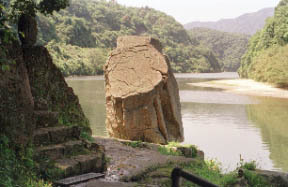 It is downstream Kizu-gawa for a while in the entrance of a lodge from the symbol "temple bell rock" juncture of standing up to its full height and a hot spring. 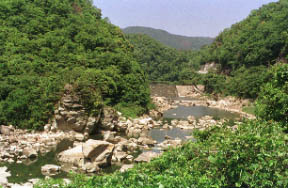 A mugenkyo is seen from Takayama Dam. 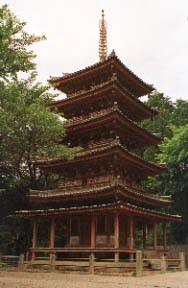 National treasure "Kaijusen-ji and five-storied pagoda"